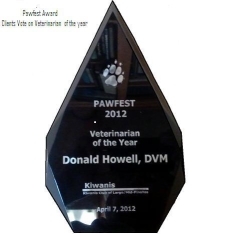 Dr. Howell was honored as Vet of the Year at Pawfest 2012. The Kiwanis Club of Largo Mid-Pinellas asked residents to select a veterinary that went "beyond the call" of duty. It was the first year Kiwanis had the award. Click here to read all about the Pawfest 2012 event!